Perhaps your crunchiest buddies can’t shut their booze-guzzling mouths about the big, dirty red they can’t get enough of. Or your pseudo-sommelier roommate keeps insisting that you “like, have to try pét-nat.” Whatever the case, natural wine is taking the drinking world by storm, and you don’t wanna be left behind in the pesticide-treated vineyard dust. Here is what you must know to finally g’au naturale. So what even is natural wine, really? 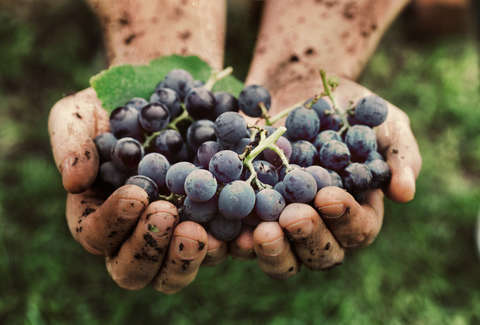 Other criteria that often classify natural wine include hand-picked grapes, no adjustments for acidity, no additives, no filtration, and no heavy manipulation. Alice Feiring, author of The Dirty Guide to Wine and writer of natural wine newsletter The Feiring Line, describes the dynamic personality of natural wine: “the wine will continue to change and each sip will be different.” She says unlike a standard, non-natural pinot grigio, which is often lab-manufactured, resulting in the same taste no matter where the grapes are grown, natural wine is unique by the bottle and lacks consistency. When and how did this become such a major thing? In a moment when our world feels faker than ever -- from the Hinge date who ghosted you to your sister’s Finsta -- there’s a collective attraction right now to what’s real, what’s natural. For some it’s raw-sounding live music recordings, for others it’s hiking, and for many now it’s wine. Natural wine isn’t new. According to Feiring, the natural wine movement as we know it began at least 40 years ago in France (obviously not including the wine made and drank for centuries before artificial ingredients and processes were invented). But within the past three or four years it has grown faster than it ever has before. This is especially obvious in New York where many of the city’s major restaurants have taken to including it in their wine lists. Natural wine is growing not only as a result of the product itself, but for what it does (and doesn’t) stand for. It has grown a following around its anti-elitist ethos. The movement has taken on an attitude that rejects the wine industry’s stereotypical snobbiness. Feiring gives the ‘gram some credit for the recent spike in interest as well. Instagram has made it easier than ever to share drink-porny pictures that pique curiosity, go viral, and spark trends. This isn’t the first time a type of wine has followed this path to popularity (we see you, rosé). Visually interesting varieties like orange wine, which is white wine processed with grape skin contact, or cloudy-looking wines, stand out on social media. The movement is not above skepticism and criticism, however. “There’s a lot of really fucked up natural wine out there,” John Bonné, former wine critic for the San Francisco Chronicle and author of The New Wine Rules, was quoted saying in a recent New York Magazine report on natural wine. His main grievances? A disregard for tradition, exaggerated value/prices, and overall amateurish-ness. Feiring’s advice to any folks curious to try natural wine for the first time? Just drink. “Drink whatever you can get your hands on,” she says. Go to a wine bar, or spend an afternoon at a natural wine fair, with an open mind, and learn what you like. To get your feet wet, ask for something cleaner in style. If it’s adventure you’re seeking, request something wild. When you start purchasing natural wines, keep in mind that natural reds, unlike their less-natural counterparts, are best-enjoyed chilled like whites. It’s also important to note that many natural wines should be sipped young instead of aged, due in part to lower preservative levels. While wine bars and shops offering natural wine are most common in New York and LA, they’re also becoming more pervasive in other cities and areas of the country including Chicago, Houston, and New England. If you’re nowhere near these hotspots, don’t fret, there likely will be natural wine near you eventually. “The movement has taken New York by storm, but slowly it is moving west and people are getting really excited about natural wines,” says Ma. For now, your best bets are ordering from online retailers, visiting wine bars when traveling, and patiently waiting. Natural wine happens to be the most nutritious food group in Alex Erdekian’s diet these days.